McDonald's has a long history in the hobby when it comes to food-issue cards. 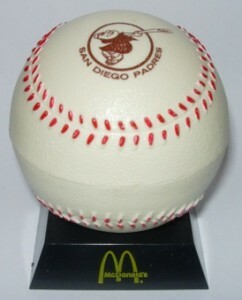 However, none are more quirky than the regionally distributed 1974 McDonald's San Diego Padres Discs. Besides the oddball look, the small set is notable for having one of the first Dave Winfield cards. 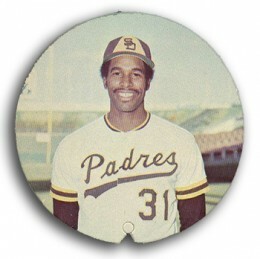 The 1974 McDonald's San Diego Padres Discs checklist has 15 cards, 13 of which are players. Winfield highlights the checklist. While few consider this to be a rookie card, it was released the same year as his first Topps and O-Pee-Chee cards. Willie McCovey is the other notable player in the set. Besides 13 members of the Padres, there is a card of restaurant mascot Ronald McDonald and one of San Diego's home schedule. The first thing you'll notice with these discs is that they don't look like regular cards. Rather than the traditional rectangle, they're circles. The discs measure 2 3/8" in diameter. The front has a picture of the player on the front. The plain backs have vital stats as well as a line for how they performed in 1973. Cards also have a notch in the bottom so they could be filed in a plastic baseball-shaped holder. A hinge allows it to be flipped open. 1974 McDonald's San Diego Padres Discs starter sets of five players, the Ronald McDonald card, the schedule card and the holder were a stadium giveaway at a Padres game on July 30, 1974. To finish the set, collectors were to buy cards at local restaurants. 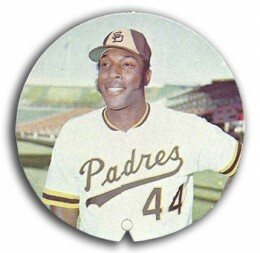 Despite their age, 1974 McDonald's San Diego Padres Discs are fairly easy to find still today. They don't carry a lot of value because of this. The quirky look is a turnoff to some as well.